First day we set out for a trip to the vicinity. 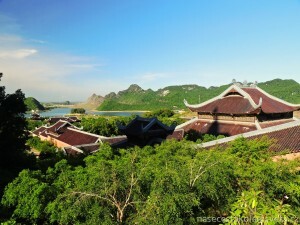 Our finish became Bich Dong Pagoda located only about 10 km (6,21 miles) from Ninh Binh. It is a beautiful temple that seems to be small at the beginning but after a short walk and steps climbing we found out that there is a shrine in the rock and there was a lot to admire. Entrance fee was surprisingly free of charge. Then we went towards the boats taking tourists to Tam Coc Cave. We really wanted to go but the price totally turned us off. They wanted 120.000 VND/person/admission (cca 5,28 USD) + 150.000 VND/boat (cca 6,60 USD) with a requirement only 2 foreigners per boat, not more. This is a lot of money for Vietnam and price has increased multiply in the last year and it is something we do not support. Nothing was lost at all. We had our scooter so we decided to ride around. We were able to get quite far and still we were meeting people on the overpriced boats along the way. And by pure accident we chanced on Thai Vi Temple in the middle of nowhere. It was absolutely amazing there and we had the whole temple only for ourselves. It was a jewel surrounded by limestone rocks. From here we drove towards Mua Cave and it was a good decision. The cave itself did not really attract us but the place is famous for its lookout point. Walk up was really difficult because it was so hot and sun was shining and burning. But it was really worth the strain. 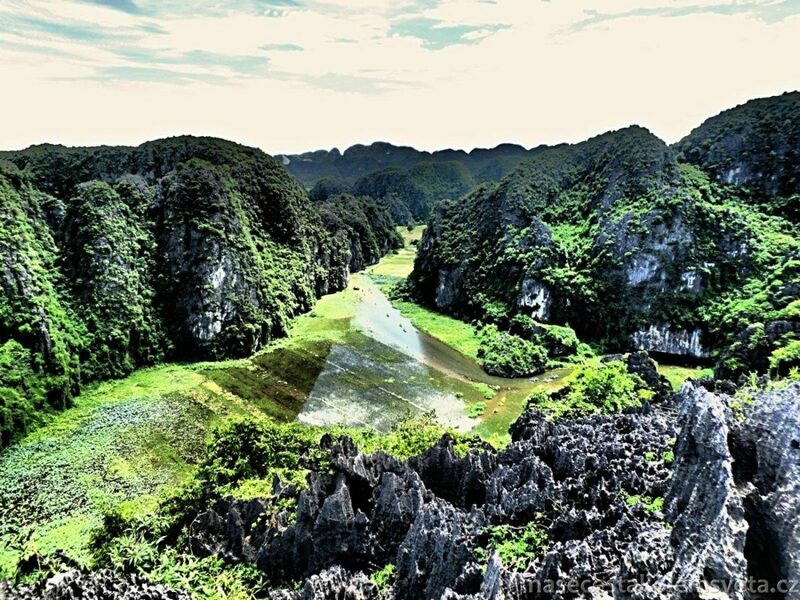 From this place there is a perfect view at the spot where people go to Tam Coc Cave. For only 50.000 VND/ person (cca 2,20 USD) it was much better experience because the view was so fascinating and beautiful. On that they we jolted through adventurous dirt road on the main road and then rode back to Ninh Binh where we rested to gain strength for the upcoming day. New day meant new adventure on our trip around the world. 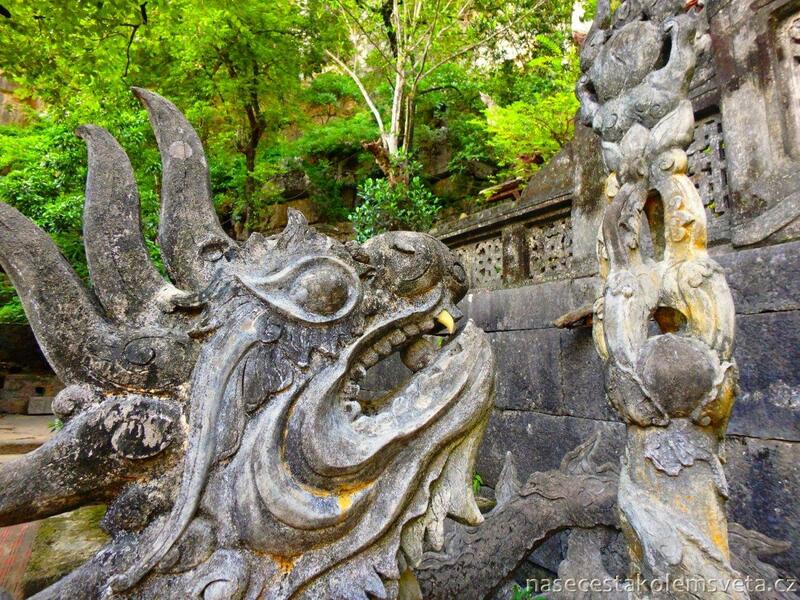 We went to explore the Trang An Grottoes. It is a complex of caves where you can get only by water. The boat gave us a ride through beautiful landscape where we took many pictures. And of course we also visited many Chinese temples that weren’t missing there. These temples absolutely mesmerized us. This 3 hour trip costs 150.000 VND/person (cca 6,60 USD). We also had to pay for parking this time 5000 VND (cca 0,22 USD). This time we did not manage to park where we wanted without paying. The trip was really very nice. But the best was yet to come without knowing it. We planned to visit the highest pagoda in surroundings. When approaching Bai Dinh Temple even from the distance we were riveted. It is truly a large, giant complex. As it is a Buddhist Temple they should not ask for admission fee. Therefore they found a different way how to get money. There are 2 entrances. To the first one they always navigate everyone. They ask for 20.000 VND (cca 0,88 USD) for parking. Absolutely overpriced and does not make any sense. For this money you can have your lunch. Therefore we parked right next to the road and took a picture of our motorbike. Locals immediately told us that it is better on the parking lot but it is just stupid talks. At the entrance there are club cars to ride you to the pagoda entrance. Allegedly you cannot walk therefore they are able to charge you 60.000 VND/person/both ways (cca 2,64 USD). Even we let them fool us. 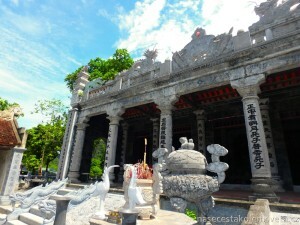 But then we found out that it was possible to stop at absolutely different road at the main entrance of Bai Dinh Temple and walk through. 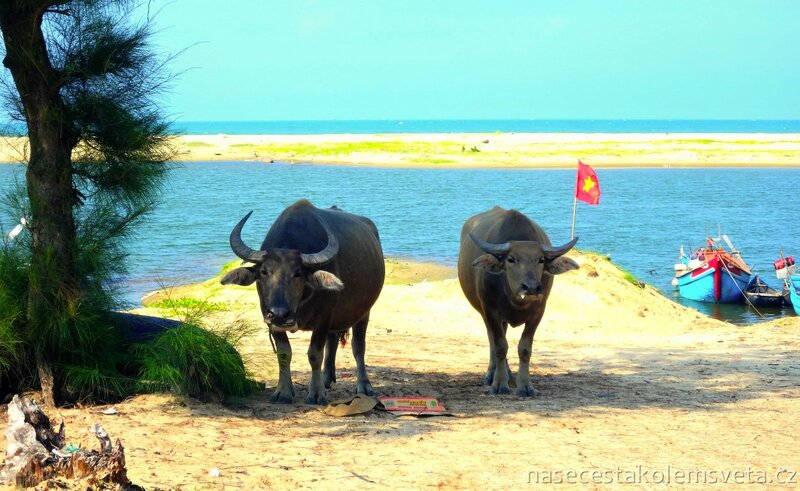 There are some locals guarding and always navigate foreigners away to the other entrance. But if you go inside they will not pull your T-shirt and you will save money for a stupid transport there. Bai Dinh Pagoda is great and magnificent place where you can spend hours. 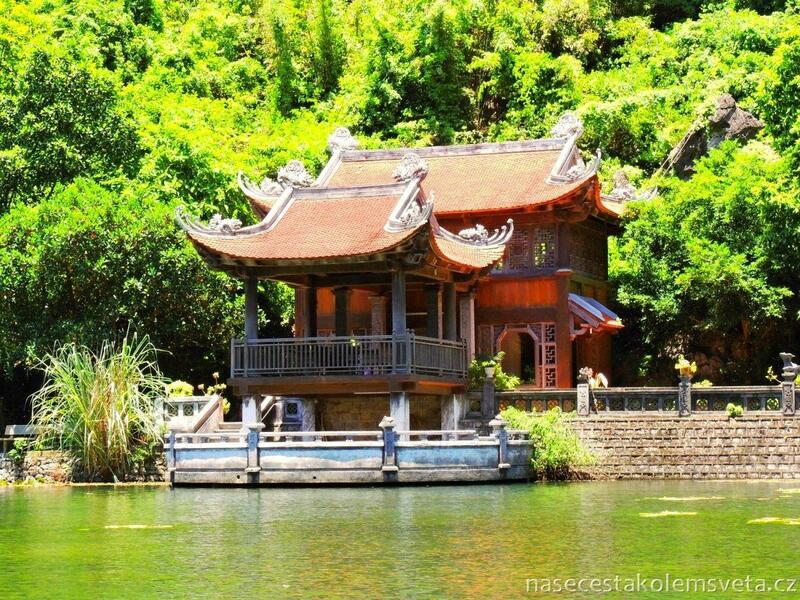 It was one of the most beautiful places we visited in Vietnam and so far in the whole Southeast Asia. There is the highest pagoda in Vietnam, the biggest bell in Vietnam and also the largest bronze Buddha in Southeast Asia. 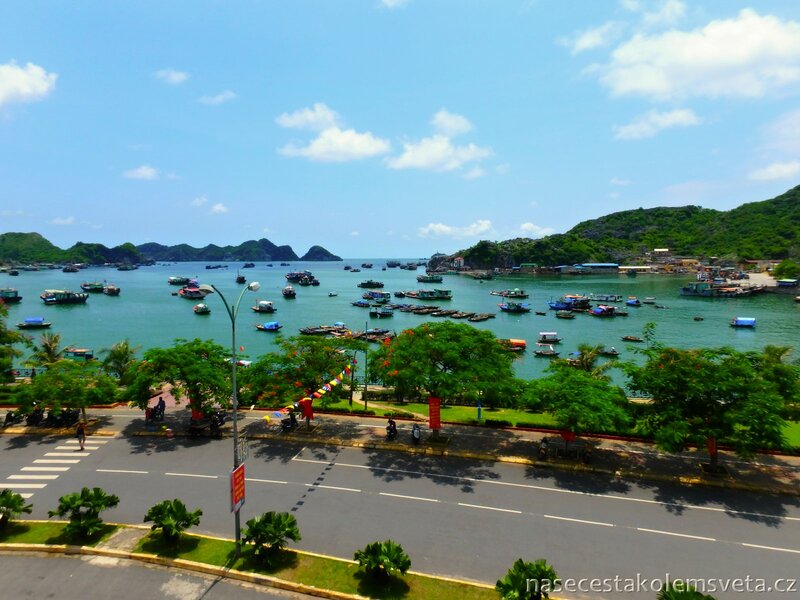 But there is much more to see at Bai Dinh. 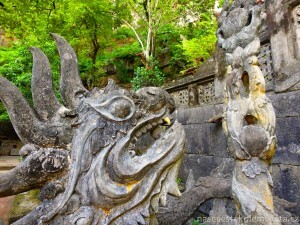 The last place we visited close to Ninh Binh was the ancient capital city Hoa Lu. We parked there for free next to the bridge that is close to the front gate. It did not take long and suddenly local woman came to us and said:”Do not park here, come to my place, where you pay.” We are not kidding at all, Vietnamese people truly miss ingenuity. But this really made our day. 🙂 Hoa Lu did not really attract us that much after our visit of Bai Dinh Pagoda. Maybe because we were a bit short of time, it was almost evening and getting dark early. 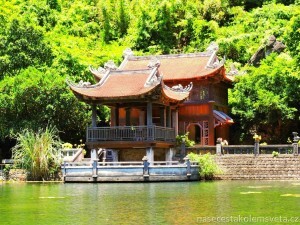 But still it was worth a visit but probably better to go first to Hoa Lu and then to Bai Dinh Pagoda. We did not manage to visit Cuc Phuong National Park that was the first NP in Vietnam and is up to now one of the most important sites for biodiversity in the country. It is possible to observe many primates in the park but you can also see leopard or jungle cat there. Flora is also very rich. But we were heading to our next destination Dong Hoi and decided to visit another National Park.